Husqvarna are about to unleash a new range of bikes and these exclusive spy shots show the firm has a few surprises up its sleeve, too. Husqvarna’s trump card is that they have access to sister company KTM’s entire range of engines and chassis platforms – and they’re not being shy about raiding the cupboard. Already enjoying good feedback on concept models revealed at shows, they’re really hoping to hit the target with a vengeance when they unleash a whole sheath of Arrow models –and these new images, grabbed last week in Spain, reveal yet another new model that Husky have been keeping quiet about. The first variants that are expected to be released are based around the Duke 390 platform, and dubbed the 401 Svartpilen (Black Arrow) and 401 Vitpilen (White Arrow). The dark side is focused on scrambler styling, while the lighter side targets the equally on-trend rush to release café racers. The firm have been very open about the duo, publicly presenting concept bikes, and promising their arrival int he near future. They have also comprehensively teased us with a hotter 701 Vitpilen café racer, but the shock lurking in this new brace of spy shots is the addition of a Svartpilen version of the 701. 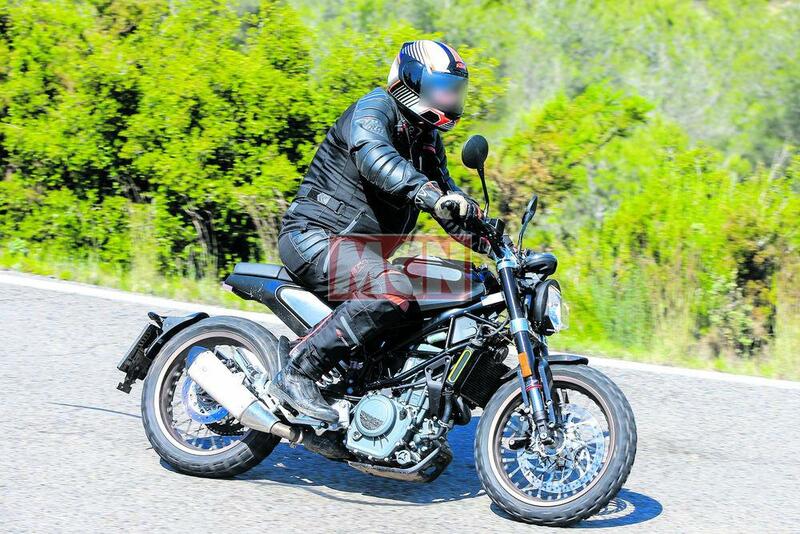 Clearly sporting a revised clock position, a scrambler-esque set of fat handlebars, dual-purpose rubber, and covered in mud, it’s a clear indication that they’re set to go head-to-head with Ducati’s Scrambler. Both versions of the larger 701 were spotted this week, but one is visibly more advanced in its development. The Vitpilen version wears far more production-ready looking components, including what looks to be a more realistic version of the spectacularly convoluted exhaust end can seen on the concept bike. While the end can and stay are still relatively rough looking, the shape looks well resolved, and there’s a neat little heel guard already in place. The collector and header look very final, and there’s even a neat pair of shrouds masking the ugliness of the collector box. The engine has moved on, too, and now proudly displays the firm’s ‘H’ logo on the main casing, while the large single radiator also wears neat shroud caps at either end. Although devoid of branding on the tank, the shape has no rough areas or duct tape visible. The tail unit shape also appears close to final, and while there is plenty of tape, this appears to simply be hiding decals, rather than its form. The pillion pad/cowl fits well, and even boasts a strap, and the swingarm-mounted mudguard and numberplate hanger are clearly final versions – while the rear light does look to be a dummy. The front light is, too, and is expected to be replaced by a round dish style unit for production. The front subframe moulding appears complete, providing a mount for the headlamp as well as a console from which LED indicators sprout. The surprise scrambler version differs in a few key areas. The road tyres are replaced by dual-purpose rubber, the clip-ons are shunned for a fat handlebar, the clock is raised and angled more upright, the rear numberplate assembly is ditched for a conventional subframe-mounted hangar, the engine is painted black and… that’s it. It looks a fair way behind the Vitpilen in terms of readiness. The 401 duo are expected to arrive soon as these prototypes are exceptionally close to the finished articles. The front lights still appear unresolved, but the rear lighting looks real enough. The exhaust can bears a lazer etched Husqvarna logo, the rad cowls have their yellow inset highlights, and with the exception of the tank cover and seat unit the bikes are displaying the final colour finishes on the wheels, engines, frame, and rearsets. Short of a lick of paint and the removal of some tape, both these 401s look showroom ready.